Mike's Jerky is a brand of Old World Beef Company based out of Albuquerque, NM. The company was started by Mike and Brenda Grier in 2008. The couple had been making jerky for many years and were always told that they ought to go into business selling it, except they were already busy running an RV dealership. But when the bad economy hit, their dealership went out of business, and that cleared the way for them to start Old World Beef Company. The company offers 16 different jerky flavors in all. I have 8 of them to review over the next couple of months. All of their jerky is thin-sliced, and dry. The first thing I taste from the surface of these pieces is light bit of black pepper, and a light dehydrated meat flavor. The chewing flavor starts with a light saltiness, followed by a light natural meat flavor, and a light black pepper flavor. For being labeled as "Black Pepper", this seems to stands up fine. I'm getting a light black pepper flavor overall, but even though it's light, it still stands out well because there isn't much other flavor to taste in this. These pieces are covered with ground pepper on one side, while the other side is bare. But the dominant flavor of this jerky seems to be the light saltiness, in that it's more noticeable than the black pepper. After that, it's the light natural meat flavor that becomes next most-noticeable. The black pepper is there to add some spice, and tends to be noticed on the back of my tongue. Overall, this jerky has a very fresh, clean flavor. Once I swallow down a piece, I don't get much aftertaste. The natural meat flavor even has a clean, natural flavor, much like the flavor of a thin slice of roast beef you get at a deli. It's a very simple flavored jerky, just light salt, light natural meat, and light black pepper, with an overall light flavor intensity. I can see several spots of fat on these slabs, but they offer no additional flavor and no additional chewing texture. I see no streaks of gristle or tendon, encountered no stringiness, and no unchewable tissues. 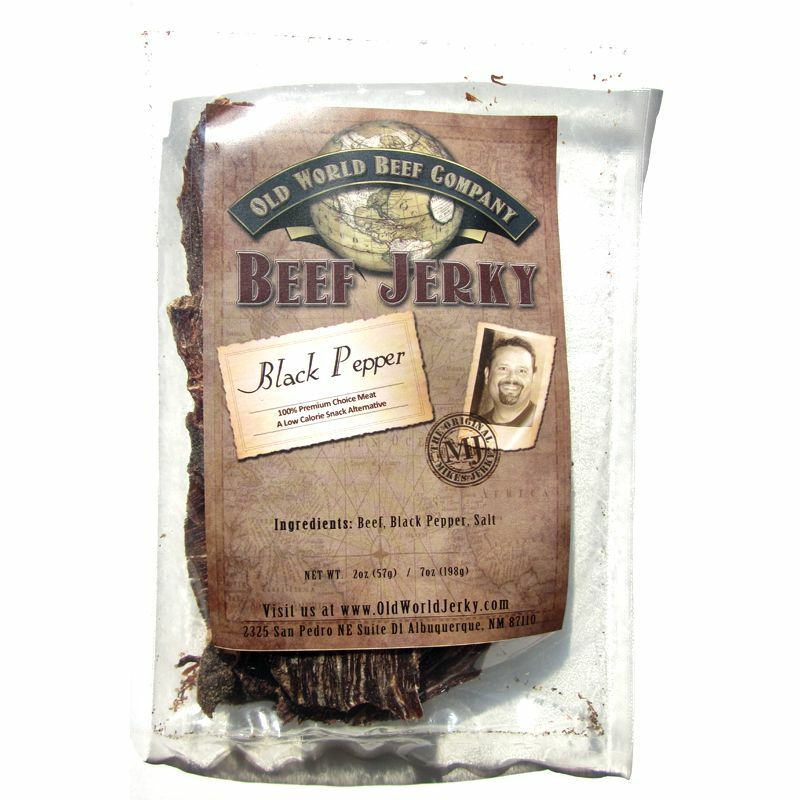 Mike's Jerky sells this Black Peppered variety from its website at a price of $5.00 for a 2oz package. If you bought 8 packages, the shipping works out to $5.38 if sent to Southern California. That comes to $2.84 per ounce. For general jerky snacking purposes, at the $2.84 per ounce price, it's a decent value. I'm getting a good deal of snackability for an overall good flavor, good meat consistency, and good chewing texture. That price is a lot higher than what you'll pay at the grocery store for one of the major brands, but I think you'll get much more snackability out of this. As a Black Peppered variety, at the same $2.84 per ounce price, it's a fair value. I do pick up a easily noticeable black pepper flavor, enough that should satisfy the peppered jerky lovers out there without going overboard. But if all you're looking for is a lot of black pepper flavor, you could actually get more from a Jack Link's or an Oberto at a lower price. This Black Pepper variety from Mike's Jerky delivers on its description with an overall light black pepper flavor, but still well-noticeable due to the fact that this jerky overall has a light flavor. The light saltiness is actually the dominant flavor, along with a light natural meat flavor. But I found this jerky to have a clean, fresh flavor that made it seem more enjoyable. It's similar to the flavor of fresh sliced roast beef you get at the deli, and even has a similar chewing texture though a little more dry. The meat consistency seems pretty good, and is easy to eat. I also enjoyed the crunchiness, which I think adds to the snacking enjoyment. I kept away from assigning a five-star rating because despite all the positives I've written, I'm still not getting that eye-opening "wow factor". 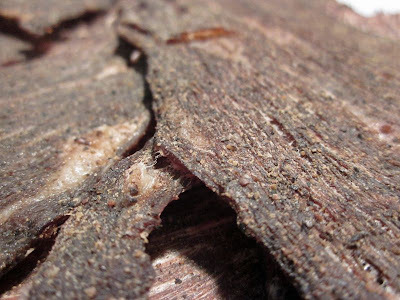 But for those of you who love thin sliced, dry jerky, this is definitely one to try. My recommended beer pairing, go with something more malty to add a sweet character. Try Widmer's Drifter Pale Ale, or New Belgium's Ranger IPA. $30.00 for 14 ozs Not even a pound of jerky plus $5.65 for shipping that's not a good deal and the crunchy part, most people are not into a crunchy jerky. That to me is a turn off right there jerky is not supposed to be crunchy your not eating a potato chip whats the deal with crunchy jerky C'mon? IF IT AIN'T FN "HOTT" I'M NOT EATING IT! I think most people where i'm located is very interested in Crispy Beef Jerky. They get tired of chewing on it all day. 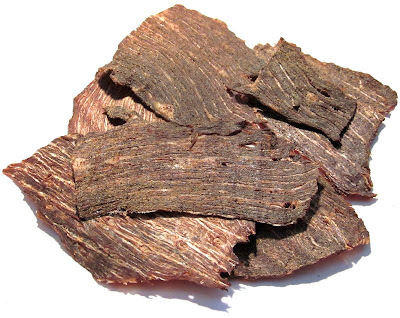 Plus Crispy Beef Jerky doesn't have all those chemicals and preservatives in it to keep it from bacteria, its dried out. More people are into Healthy were i'm located here in Southern California, US. Which has one of the biggest population per square mile in the world!